Former UM student Jacob Rudolph said being matched with someone who understood what he was going through was one of the best experiences of his college career. Without UM’s LGBTQ+ Mentorship Program, he would not have had that opportunity. The mentorship program pairs students with a mentor on UM’s faculty or staff. Rudolph, who graduated in May 2017, said he formed a life-long friendship with Meredith Camel, executive director of UM Communications. “It was just really nice to have someone who has been through so many of the challenges that LGBTQ people face in their lives to just be able to talk it out one-on-one and not feel worried about being judged whenever I wanted emotional support,” Rudolph said. Along with offering personal, professional and academic support to UM students, mentors are in charge of directing mentees to campus and community LGBTQ resources and increasing mentorship capacity for LGBTQ-identified students. For students in the LGBTQ community, such as Emma Lam, the program provides an opportunity to get in touch with campus resources. 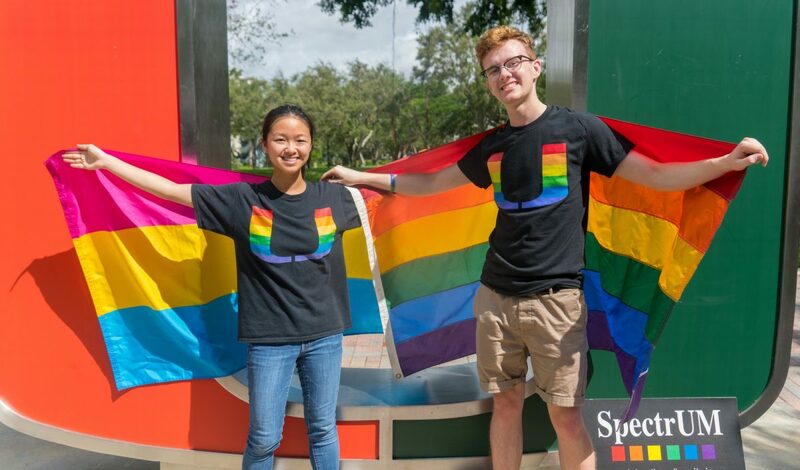 Lam, a sophomore and secretary of SpectrUM – UM’s largest LGBTQ student organization – said the main focus of the program is for students to foster a relationship with their mentors that will facilitate academic and professional development according to their personal needs and goals. “Students will have the opportunity to learn from the guidance of experienced university employees,” she said. Anthony Sis, assistant director of UM’s LGBTQ Student Center, said the mentorship program’s application has undergone a few changes this year. Instead of mentees choosing their mentors after a social at the start of the academic school year, the pairs will be selected in advance. Sis said more questions have been added to both mentee and mentor applications to select the best pairings based on personal and academic interests. The main goal of this program is to connect students with faculty and staff members at UM, who are either members or allies of the LGBTQ community, Sis said. Mentors are meant to provide support through individualized engagement. The program, was originally created by LGBTQ-identified members in the Butler Center prior to the LGBTQ Student Center’s opening in August 2016. Typically, between 10 to 15 mentees and mentors apply. The only requirement to become a mentor is to be a faculty or staff member with a strong desire to empower and support LGBTQ students and allies. There are no specific requirements to become a mentee, and any undergraduate UM student can apply. Mentors and mentees must fill out the Mentor Application Form and Mentee Interest Form, respectively. Both forms can be found on OrgSync. Rudolph said he encourages students to apply because the program matched him with “one of the top three people” he met at UM. “There’s nothing to lose and everything to gain,” Rudolph said. To learn more about the LGBTQ+ mentorship program, visit lgbtq.studentaffairs.miami.edu.